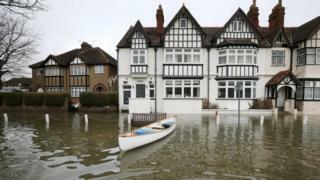 Heavy rain has brought extensive flood damage to the UK, with further threats to come in the coming weeks. The expectation is that this will bring a string of insurance claims from residents whose homes and vehicles have been damaged. It comes after the St Jude storm in southern England in October, which led to insurance payouts of about £130m, and the tidal surges and gales during December and the festive season. Insurers have representatives in many of the areas affected, along with other authorities. But the Association of British Insurers (ABI) says that people can take action to mitigate the damage. How can I prepare for the bad weather? Keep up to date with the latest weather forecasts and warnings. If you may be affected then make sure you have emergency contact numbers for your insurer, local authority and utility companies to hand in a safe waterproof place. Secure any things in the garden that could cause damage in high winds, such as ladders. Move a car away from an area that is expected to flood. In addition, move valuable and essential items upstairs or to a higher place. Check it is safe to use gas, electricity and water supplies. Keep a fully charged mobile phone with you. I've been affected. What should I do first? Insurers advise that you should contact them as soon as possible. Most companies offer a 24-hour emergency helpline. But it is important that serious damage is inspected as soon as possible. Most household, business and comprehensive motor policies cover both flood and storm damage. If damage is serious, and you need to move out of your home temporarily, most policies will cover the cost up to a specified limit. Typically you can spend up to 20% of the total insured value to cover alternative accommodation and heating costs. What happens if my home is flooded and residents are evacuated? Your insurer will offer to provide or pay for the cost of appropriate alternative accommodation, as well as the cost of resulting expenses such as the removal and storage of undamaged property. Those with buildings insurance cover will be entitled to the insurer drying, cleaning, repairing and restoring the home. Those with contents cover can expect the insurer to dry, clean and restore possessions, or replace or pay for any items that are so badly damaged they cannot be cleaned up or repaired. It can be a year before residents are able to move back into a badly damaged home. Comprehensive motor insurance covers damage to your vehicle, but third party, fire and theft cover does not include damage from storms or floods. If your vehicle is damaged by something such as a falling roof tile, to be able to claim against the homeowner you would need to show that they were legally liable or negligent. Insurance companies say they are not expecting premiums to go up "across the board". It is worth considering that the mild weather has meant expensive frozen and burst pipes claims have been low this winter. However, more than one claim during a year can push up a premium at renewal. A claim could also bring a no-claims discount to an end. How much will this all cost insurance companies? The ABI has estimated the flooding over Christmas and the new year has led to claims totalling £426m. This figure is likely to rise as the wet weather continues. The St Jude's storm in October cost £130m. The great storm of October 1987 cost insurance companies £2bn in today's money. The floods in the summer of 2007 cost more than that: £3bn. The overall cost of storms and floods will be much higher than the insurers' bills. Councils face a cost of hundreds of millions of pounds to repair roads, in addition to the bill for patching up council buildings and providing emergency help. Is there a question mark over insurance in the future? The insurance industry and the government were locked in talks for months over the future of policies for those in high-flood-risk areas. A deal was reached for a new system to be put in place by the summer of 2015. Under the plan, a not-for-profit fund, called Flood Re, will be built up from a levy charged on insurers instead of a general rise in premiums across the board. This fund will be used to cover the cost insuring these homes. Householders in high-risk areas will have the cost of insurance capped. This limit on premiums, for all but the most expensive homes or homes built since 2009, will be based on council tax bands. For example, premiums will be capped at £210 a year for those living in homes in council tax bands A and B. This cap will rise for bigger homes to £540 a year for homes in band G.
However, the Council of Mortgage Lenders has raised concerns about some of the properties not covered by this deal, such as commercially insured privately rented homes. Meanwhile, the government has promised to spend money on flood defences. How to insurers assess the flood risk? They use a number of sources, but one is the Environment Agency. Among the tools is the Agency's postcode search map that can be used by anyone to assess the risk of some, but not all, types of flooding. This is often used by during searches by people thinking of buying a home in a certain area.